Is Peru on your bucket list? One of the top destinations to visit this year. This custom 11-day soft adventure tour Includes three nights in an Amazon Jungle Lodge, an overnight stay in Machu Picchu, plus Lima and Sacred Valley. Your trip includes a direct flight from Toronto, domestic flights within Peru, all accommodations, breakfast every day, five lunches, five dinners, guided tours and more. 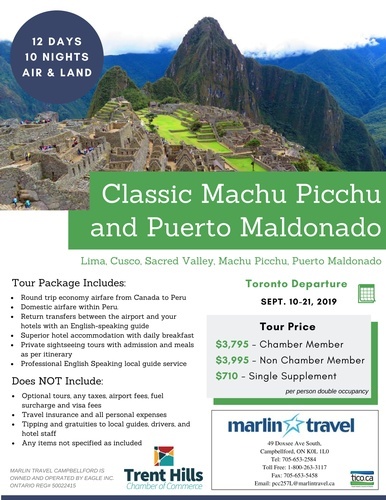 A trip of a lifetime brought to you by the Chamber Travel Program in partnership with Marlin Travel Campbellford.